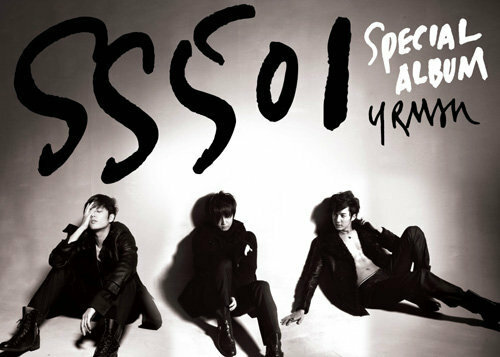 We are all dying to hear news about SS501 members right? Well, maybe our dear prince Young Saeng heard us, he visited DSP TOK TOK last night to chat with fans! And boy, was he chatty! He spent almost an hour of his time in the chatroom! Lucky fans who were there to chat with him. You will laugh with some of his statements. I can see he's also a bit 4D like Leader! Hahaha. Witty and wordy! He sounds happy, don't you think? We miss you Saengie!!! Fan: Young-saeng, do you still like seasoned spicy chicken? Fan: Huh, Young-saeng rocked in “Inki gayo”. Did you get to see the flank card?? Fan: I think I have not chatted with you in two years, isn’t it??? Fan: Why do you rarely come and go~~~!!! Fan: So…you should log in often…you want to be friends, don’t you?? Young-saeng: Ah~~~yes, we are all friends!!! Young-saeng: I was about to write profound things in here but I decided not to!! Fan: Tell them that I wish you all to win the first place! Fan: Nah~~~ You probably were a smart student, weren’t you??? Fan: Was Music the easiest subject for you??? Fan: Ha!!!!! If you are not a musician, then who is!!! Fan: Did you gain weight??? Fan: My mom said you’re sturdy!!! Fan: Young-saeng…. You laughed at what I said!! Wow!!! Fan: Have a great time here~~~!!!!! Fan: Young-saeng! I’ve written a fan fiction about you and Hyun-joong! Fan: Please say something to your fans overseas~!!!! Fan: Young-saeng!!! Aren’t you going to advance to America??? Fan: Really!! When??? You should hurry because we miss you!!! Fan: We are not old!!!!!!!!! Fan: Not that!!!! I’m asking what time you came here…. Fan: Young-saeng, you said you don’t like seasoned spicy chicken and why is that? Fan: Ha-ha-ha-ha, did you watch the soccer game last night? Fan: Who did you watch the game with!!?? Fan: Is soju (Korean spirits) good????? Fan: I heard that Kyu-jong is hard drinker. Fan: Why, why, why? What did Kyu-jong do???? Fan: I’m a one hard drinker!!!!! Fan: I’m a minor….I can’t drink!!!!! Fan: Young-saeng, catch an insect for me. Fan: Your English keyboard doesn’t work Young-saeng? Fan: Should I get a contact with a home page administrator?? Fan: Jung-min does not log in here. Tell him to come in here. Fan: What did you have for dinner Young-saeng? Fan: You can change it by pressing tab on the left and then enter. Fan: Young-saeng, I just found out that the administrator purposely set that setting like that! Fan: What are you doing these days Young-saeng? Fan: You’re doing good, right? Fan: You should visit Taiwan! Fan: Do u miss Taiwan fans? Fan: Why can’t you go???? Young-saeng: How do I say in English, “I want to go”? Fan: You should go to Canada too… Let’s go to the World Tour! Young-saeng: I have a chic image. Fan: Why can’t you go to Taiwan?? Fan: So I meant, why can’t you go?? Young-saeng: It’s a grown up thing. Fan: If you can’t go to Taiwan, then when can I see you? Young-saeng: What is Uto? [Young-saeng] Uto is a nickname of the fan. Ha-ha. You fool, Young-saeng, ha-ha. Fan: Don’t, I like it the way it is. Ha-ha. Fan: Did you talk to Hyun-joon? Young-saeng? Fan: Hyun-joong’s husband!!!! Young-saeng is ignoring me!!!! Fan: Focus on the talk, Young-saeng!! Fan: No virus for the computer, ha-ha-ha. But it’s a heck of a slow super computer~ ha-ha-ha. Fan: Where did you watch the soccer game yesterday?? Fan: Young-saeng!!! What are you doing?? Ha-ha-ha, what are you doing now? Fan: Huh, Young-saeng!! I’m calling you~~ Please get in here~ ha-ha-ha. Fan: How are you Young-saeng? Fan: Please respond if you’re there. Fan: My man! Huh, Young-saeng!!! Fan: Take care of yourself and please write. 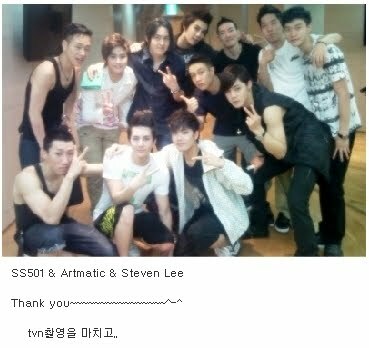 Saengie also posted in his CYWORLD the picture below w/ ss501, Steven Lee and Artmatic, saying THANK YOU.